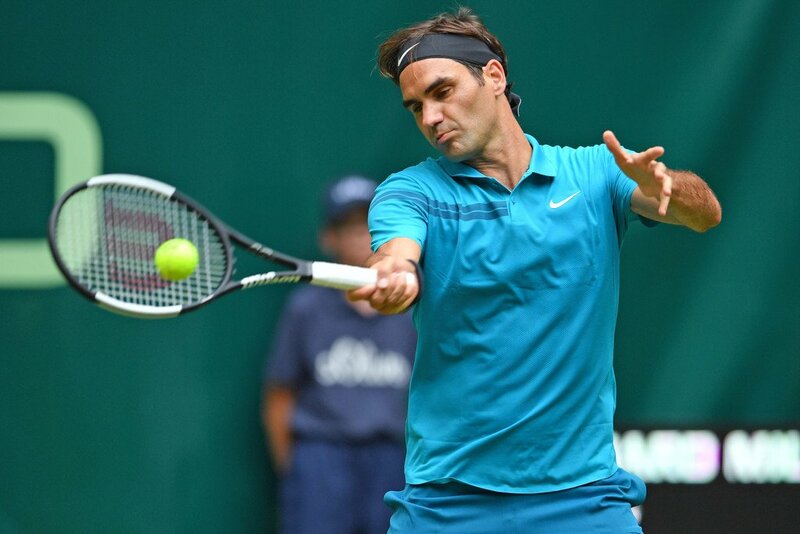 A quick turnaround from Stuttgart with just one day's rest but it didn't take long for Roger Federer progress into Round 2 at the Gerry Weber Open on Tuesday, defeating Slovenia's Aljaz Bedene 6-3, 6-4 in just 71 minutes. The Swiss came into the match having secured title number 98 plus a return to No. 1 in the ATP Rankings at the weekend and carried on from where he left off, picking apart his opponent with relative ease as he set up a tie with Benoit Paire on Thursday. Bedene won the toss and elected to receive. Federer kicked off with an impressive hold to fifteen to put the pressure straight onto the Slovenian. Some nervous opening shots saw Bedene slip to love forty but Roger wasn't in a ruthless mood, allowing Bedene to make deuce and hold multiple game points before he finally broke his serve in an 8-minute game. Into set two and a Bedene double fault on the opening point meant things didn't look too promising for the current world number 72 but he dug in to hold and from there began to find a bit more oomph to his game. Roger's serve was still yet to be tested though and although his return game seemed to drop a notch he moved through the gears again in game nine to break, using his slice to great effect before serving it out to fifteen, hitting an inside-out forehand winner on match point. Solid start here from Roger against an opponent who you always feel he'll have the measure of but will still make him work for the win. I thought he picked up from where he left off in Stuttgart really and although things got a bit scrappy in the middle of set two, his serve was again watertight not facing a single break point and winning 88% of points behind his first delivery. It was pretty much a cruis control match as he was never in any real danger and his slice was his best shot today, skidding through the court and Bedene struggled to do much with it. Nice to see him put his foot down and get the instant response too in that game to break where he'd looked rather lackadaisical on the return in the two or three games before it. So ideal start: bag the win, day off Wednesday and then come out fresh for Round Two on Thursday. What did you guys think of the win? Which court do you prefer Halle or Stuttgart? Let me know in the comments. Decent level from Fed throughout, bit scrappy in the second as Bedene played better but made his move at just the right time to come through with zero fuss. No no I meant ? KO. Yes it’s a solid start for Roger! he looks comfortable and happy. Love the colors he’s wearing. Jonathan, many thanks for the recap and the highlights. Yeah it’s a cool outfit. Nike for Wimbledon? Still nothing sorted. Any planed Nike Wimby outfit leaked yet? Thanks for the recap Jonathan and I am happy because I learnt a new word in English : lackadaisical ! I had never heard it ! I am leaving tomorrow at 5:30 am 🙂 for a three-day seminar in the South of France… I will try to catch a few strokes of Mr Turquoise in Halle between two meetings… and for sure will read your match recaps, Jonathan … Hopefully, there will be a semi and a final to be savoured over next week-end and maybe a 99th title … but not against A. Zverev this year – who lost today. PS : happy to see fully packed centre courts either in Queens or in Halle… better than empty chairs in Roland Garros !! I wouldn’t expect a non native to know that word 😀 tbh I would guess a high % of English people have no idea what it means. I heard Zverev looked laboured, not practised much since French leg injury but ok now supposedly. Gosh five matches and He is just in a different zone already. I only see him getting more and more better in days to come. I dont thing we ll be surprised to see him win the whole thing here too. Just hope he doesnt get to carried away a tale a bit of rest next week to keep himself fresh for Wimbledon. I think he took today off, surely gonna have 1 or 2 days off next week too whatever happens in Halle. Those serve percentages are very,very good.A sound win.Whatever happened to Sascha,is he still injured or back too soon? arch sycophant Andrew Castle,warbling about the genius of Murray,that was a brilliant shot(about a ball six inches out,Etc,Etc.Kyrios seemed flat,Murray was well,Murray. Yes, the commentator was dire. He didn’t seem to know much about Kyrgios, was surprised when he served a first type serve as his second and didn’t know what a SABR was and lots of blah about Murray. I watched a bit of Queens today, Fleming Castle combo, not terrible but not great. Castle is listenable in terms of his voice. Fleming bit annoying. Surely it was John Lloyd not Fleming!,We cannot have been listening to the same people! Nah it was Castle and Fleming on the Wawrinka Querrey match. Castle gets a ton of hate but I don’t mind him on non Murray matches. Same for Inverdale he’s alright at the on-court interviews. Thought his approach at the start was indeed lackadaisical (lovely word) but he woke up when he needed to. Not a terribly interesting match. Watched the Murray/Kyrgios match after it and was surprised to enjoy it. I think I quite like K. for his playing and for his ability to win when he decides he wants to. Not so much for his antics which often lose the point. Hope Fed gets his focus focused on Thursday. In set 1? I thought set 1 he was pretty good, should have broken in game 2 sooner than he did but from there seemed dialled in. Set 2 was a bit more laboured. NK is decent, I like his game brings something a bit different. Not sure I’d follow him but sort of guy I’d want to win most times when he’s playing someone other than Fed. Yes, lackadaisical, one of my mother’s favourite words. Thanks for the write-up. I don’t know about these titles lately. Perhaps you should consider a career with the Daily Mail. Sounds like Fed likes the conditions at Halle. Perhaps a rest for Wed. I heard Murray was still limping? Anyone see that? Never heard Andrew Castle, seems like I’m not missing much. We need the weather changed, J.
Didn’t watch Murray, saw his interview though, said he felt tired in third. He was limping when he was winning slams though, so hard to really know what hurts for real. I enjoy matches the most when Federer wins easily. 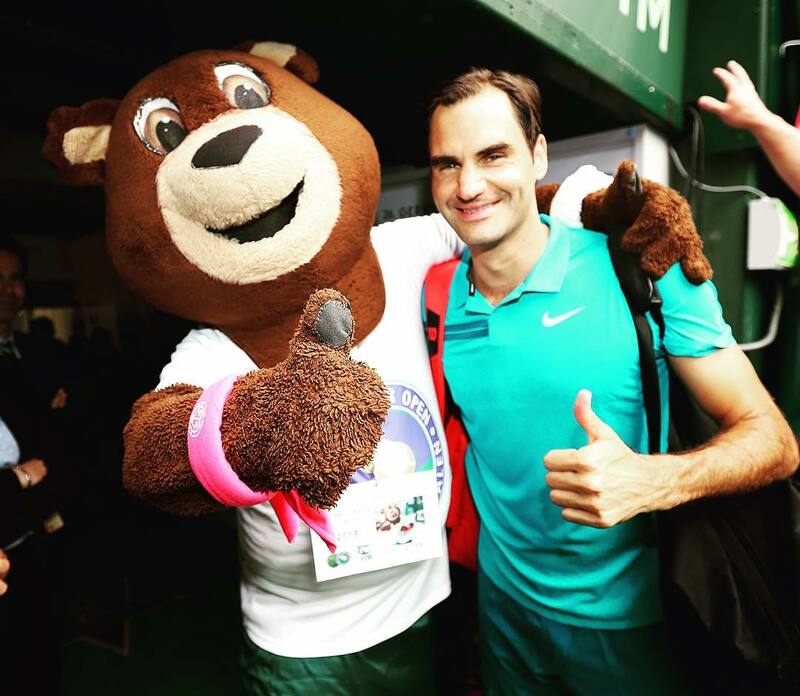 My partner in FedFandom prefers a more competitive match….you know, the “fun” ones. This was the first match in the past week or so that I was able to relax and appreciate the shots without my stomach in knots. Let’s hope it’s smooth sailing to # 99. And then…..but I don’t want to jinx it. Good start for Roger, cant help to talk about Murray vs NK match. Its such a weird match, can’t find the right word to describe it. Two tweeners from NK in the third game! more of the same but now Murray limping and wincing.Completely surreal . Nothing like Fed to bring a bit of calmness to the calmest surface. I see Halle draw is getting easier everyday for our guy Roger. Should Roger win Halle and it would be his 99th. How motivated would Roger be going for his 100th victory at Wimbledon? Yes, I love the scenario, numéro 100! Sascha to five at Roland Garros and contributed to his failure there.I reckon he will be the finalist from the bottom half of the draw.Perhaps not so easy for fed after all. Looking at the game stats you might be right about the Russian youngster comrade. I wouldn’t have thought Paire is going to give Fed any problems.Straight sets I would say. Solid start, nothing fancy, and good stats. Paire is trickier but Rog knows this court so well. I prefer the faster conditions at Stuttgart. Halle always looks shocking on the telly. I see the seed are falling like ninepins at both Queens and Halle. To be expected. Welcome to grass season. I am actually going to Queens on Thurs, first time for years and am quite intrigued to see Novak v Grigs. ( I expect Novak to win) and Nick v Kyle. Wld love to see Nick win the whole damn thing tbh. Have a lovely day.It will be interesting to hear what you think about Djokovic and where his game is. Agree about Kk,could be dangerous at Wimbledon too,let’s hope he is in Nadals half? Have a fab day, Susie 🙂 Going to Wimby, too? What the heck just happened at Halle? Paire in overdrive or sub-Paire Fed? though it was going long and then Paire couldnt find his first serve when he needed it most. Talk about cutting things fine?